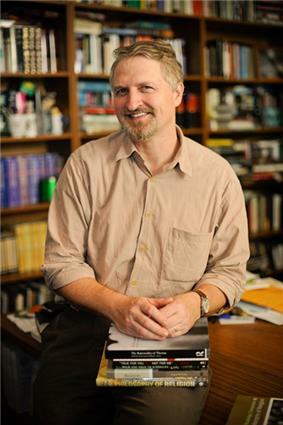 Paul Copan (born September 26, 1962) is a Christian theologian, analytic philosopher, apologist, and author. He is currently a professor at the Palm Beach Atlantic University and holds the endowed Pledger Family Chair of Philosophy and Ethics. He has written and edited over 25 books in the area of philosophy of religion, apologetics, theology, science & religion, and the historicity of Jesus Christ. He has contributed many articles to professional journals and has written many essays for edited books. For six years he served as the president of the Evangelical Philosophical Society. Paul Copan's father, Valery Copan, is of Ukrainian origin, and his mother, Valtraut (Kirsch) Copan, was born in Riga, Latvia. He was born in Cleveland, Ohio and then moved to Connecticut as a teenager. 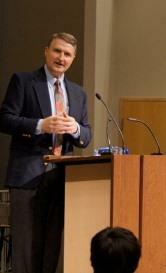 In May 2000, Copan received his Ph.D. in philosophy of religion from Marquette University in Milwaukee, Wisconsin. His dissertation topic was "The Moral Dimensions of Michael Martin’s Atheology: A Critical Assessment." Copan at Tyndale University College. His talk, "Slavery and Genocide? A Fresh Look at Two Old Testament Ethical Issues" addressed charges that the Old Testament condones slavery and genocide. Copan started his career on the pastoral staff of First Presbyterian Church in Schenectady, NY. He served with Ravi Zacharias International Ministries and was Adjunct Associate Professor at Trinity International University (Deerfield, Illinois). He was Adjunct Associate Professor of Theology and Philosophy at Bethel Seminary. He was Adjunct Associate Professor of Philosophy at Georgia Perimter College. Currently, Copan is the Pledger Family Chair of Philosophy and Ethics/Professor, Philosophy and Ethics at Palm Beach Atlantic University in West Palm Beach, FL, where he received the Mentor of the Year award. He has criticized the presumption of atheism, i.e. the notion that atheism should be one's default position when evaluating arguments over the existence of God. He argues that such a position rigs the rules, since atheism is just as much a claim to knowledge as theism. The only netural default position is agnosticism. Copan cites atheists such as Baggini and Flew in arguing that atheism is not a mere lack of belief but a rejection of belief in God or gods. He argues that atheists often slide into defending agnosticism when asked for reasons for their view. He suggests that scientific naturalists will argue that all claims of knowledge have to be scientifically verifiable; otherwise, they are meaningless. Copan argues that such a position commits the fallacy exemplified in Horton Hears a Who. "If you cannot see, hear or feel something, it does not exist." Copan argues that this position is an arbitrary philosophical (rather than scientific) pronouncement. He also argues that the position of the scientific naturalist is self-refuting because scientism itself cannot be scientifically verified. Copan also believes that belief in God is generally not a psychological crutch, claiming that the argument that Christianity is wish fulfillment itself falls victim to a number of fallacies. Freud himself admitted to Oskar Pfister that psychoanalysis of religion has no clinical evidence, and are merely Freud's personal views. Copan also argues that it is odd and arbitrary to claim that whatever brings comfort and solace is false. He notes that comforting father figure, while unique to the biblical faith, is not at the heart of the other world religions. Copan also notes that the wish fulfillment argument against Christianity is a classic example of the genetic fallacy, claiming that because one can explain how the belief arose, that the belief is therefore false. Copan is also a critic of presuppositionalism, arguing that Christians can use common ground to engage non-Christians in debate. He argues that presuppositionalism begs the question. It assumes that God exists in order to argue that God exists. Instead, Christians can begin dialogues with non-Christians with common ground such as the law of non-contradiction. Copan uses Genesis 9:6 to make his point. He claims that the image of God was not completely destroyed in the fall, meaning that non-Christians can respond to general revelation, arguments from cosmology and history, as well as personal testimony and living a godly life. Ultimately, Copan argues, presuppositionalism confuses private knowledge of God with public proclamation and argument for God. One can have epistemic certainty of God's existence from private experience and still appeal to public evidence to persuade others of that fact. Copan is known for his defense of the ethics of the Old Testament, particularly divine command morality. He argues that the books of Joshua and Judges are literarily connected, and therefore need to be read in light of one another. The book of Judges demonstrates that military engagement. The sweeping words like “all,” “young and old,” and “man and woman,” however, are stock expressions for totality — even if women and children were not present. This stereotypical ancient Near East language of “all” people describes attacks on what turn out to be military forts or garrisons containing combatants — not a general population that includes women and children. Copan states that we have no archaeological evidence of civilian populations at Jericho or Ai. At first glance, it appears that Joshua captured all the land, defeated all the kings, and destroyed all the Canaanites. Joshua later refers to nations that “remain among you,” and he warns Israel not to mention, swear by, serve, or bow down to their gods, indicating that he did fulfill the command, and yet did not literally obliterate the Canaanite population. Copan states that Joshua uses ancient conventional warfare rhetoric. He notes many other ancient Near East military accounts are full of bravado and exaggeration, depicting total devastation. Ancient Near East readers knew this was massive hyperbole and not literally true. Copan argues that the Biblical concept of slavery is misunderstood. He says that we should compare Hebrew debt-servanthood (many translations render this “slavery”) more fairly to apprentice-like positions to pay off debts. This resembles indentured servitude during America’s founding when people worked for approximately 7 years to pay off the debt for their passage to the New World. Copan states that God did not allow physical abuse of servants. If a servant was harmed, for example, by having a tooth or eye knocked out, the servant received freedom immediately. Masters that killed their servants were put to death. He also argues that the New Testament is not silent on the issue of slavery. During the first century, 85 to 90 percent of Rome’s population consisted of slaves in both lowly and prestigious positions. This was a much higher percent than Israel had in the Old Testament, but this was due to Rome’s policies and laws. Copan uses James 3:9 to argue that the New Testament presupposes a fundamental equality because all humans are created in God’s image. Christian masters called Christian slaves “brothers” or “sisters.” The New Testament commanded masters to show compassion, justice, and patience. Their position as master meant responsibility and service, not oppression and privilege. Given the spiritual equality of slave and free, slaves even took on leadership positions in churches. He states that early Christians undermined slavery indirectly, rejecting many common Greco-Roman assumptions about it and acknowledging the intrinsic, equal worth of slaves. Copan argues that if the New Testament authors had been too explicit about overthrowing Rome's slavery system, it would have done the gospel a disservice. Rome would have quashed any such flagrant opposition with speedy, lethal force. Copan concludes that the New Testament took a more subversive strategy, by opposing oppression, slave trade, and treating humans as cargo — which eventually led to a slavery-free Europe a few centuries later. Copan defends the Old Testament imprecatory psalms, which are psalms that call down curses and divine judgments against Israel's enemies. He argues that they fit into the literary genre of the time. He states "Consider how you would react if a neighbor tried to seduce your daughter or give your children drugs. Outrage indicates that we care and take injustice seriously." Copan also compares these psalms to the emotional rants of Jeremiah, wishing he had remained in his mother’s womb until he died. Jeremiah's desire was one of emotional outburst, and he did not sincerely believe what he said. Copan argues that the imprecatory Psalms should be read in the same way. Copan is married to Jacqueline Mariette (van Tol) Copan, the daughter of Dutch parents, and they have six children. Society of Christian Philosophers, 1986–present. Society of Biblical Literature (and American Academy of Religion), 1999–present. American Catholic Philosophical Association, 1999–present. Board of Contributors, Christian Research Journal, 2006–present. Salvo Magazine: Board of Editorial Advisors 2000–present. "How do you know you're not wrong? ": Responding to Objections that Leave Christians Speechless. (Grand Rapids: Baker, 2005). (Co-authored with William Lane Craig), Creation ex Nihilo: A Biblical, Philosophical, and Scientific Exploration (Grand Rapids: Baker Book House, 2004). True for You, But Not for Me: Overcoming Objections to Christian Faith (Minneapolis: Bethany House, 2009). An Introduction to Biblical Ethics: Walking in the Way of Wisdom. IVP Academic. July 2014. The Gospel in the Marketplace of Ideas: Paul's Mars Hill Experience for Our Pluralistic World. IVP Academic. July 2014. Did God Really Command Genocide? Coming to Terms with the Justice of God. Baker Books. Oct 2014. A Little Book for New Philosophers. Baker Books. ^ "Paul Copan". Faculty Page. Palm Beach Atlantic University. Retrieved 28 January 2014. ^ "Paul Copan". Sun Sentinel. Retrieved 28 January 2014. ^ "Curriculum Vitae". Retrieved 11 March 2014. ^ "Paul Copan". IVP. InterVarsity Press. Retrieved 28 January 2014. 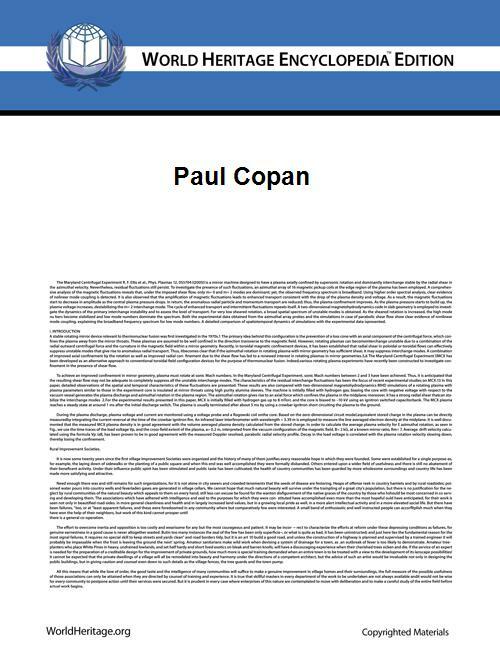 ^ "Paul Copan CV". Retrieved 11 March 2014. ^ Copan, Paul (Spring 1996). "The Presumptuousness of Atheism". Christian Research Journal: 8. ^ Copan, Paul (Summer 2013). "Atheism and the Burden of Proof,". Christian Enrichment Journal. ^ Copan, Paul. "If You Cannot Scientifically Prove Your Belief, Is It Meaningless?". Enrichment Journal. ^ Copan, Paul. "Is God Just a Psychological Crutch". Enrichment Journal. ^ Copan, Paul. "Questioning Presuppositionalism". The Gospel Coalition. Retrieved 11 March 2014. ^ "Making Sense of the Old Testament God". Baker Publishing Group. Retrieved 11 March 2014. ^ Copan, Paul (Fall 2010). "How Could God Command Killing the Canaanites?". Enrichment Journal: 138-143. ^ Copan, Paul (Spring 2011). "Does the Old Testament Endorse Slavery? An Overview". Enrichment Journal: 108-110. ^ "Why Is the New Testament Silent on Slavery — or Is It?". Enrichment Journal: 10. Fall 2011. ^ Copan, Paul (2008). "Hateful, Vindictive Psalms?". Christian Research Journal 31 (5): 50–51. ^ "God: A Moral Monster". Bible Gateway. Retrieved 28 January 2014.